This is for the hardworking men and women of today. Regardless from which industry you come from, you deserve to reward yourself from time. This Friday and weekend is a good start as the salary also just came in. 🙂 Reward yourself with Jollibee’s new Ultimate Burger Steak! Jollibee Chicken Joy, et al. From the same food chain who gave you the Chicken Joy, Breakfast Joys, the 39ers, and the more recent Grilled Pork Tenders, Jollibee offers something new for the hefty foodies – the Ultimate Burger Steak Meal. 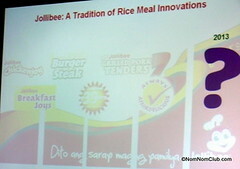 Without having to wait for 5 to 10 minutes anymore, Jollibee supersized their burger steak meal into a pan-grilled 1/3 lb. CHAMP patty, smothered with mushroom gravy, mushroom slices, and a dash of toasted garlic on top. A bed of crunchy french fries supports the ultimate patty from below while a a sunny-side-up egg rests on a serving of rice on the side. Priced at P109 for solo and P119 with drink, I say this is one power-filling meal for the demanding appetite. Together with a group of foodie bloggers, we got to take first dibs of this new offering in an intimate gathering at their Research and Development Center in Ortigas. It was a filling treat of 100% Pure beef but it didn’t stop me from being among those who finished the whole serving in just a few minutes (including photo-taking, instagraming, twitting with #TheUltimateMeal, and Facebook-ing; have you seen the photos of Jollibee Singapore circulating around Facebook yesterday? They said it’s located at the 4F of the Lucky Plaza. 🙂 ). 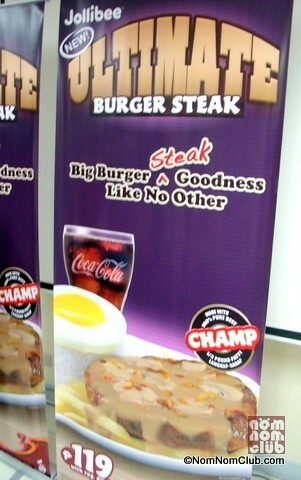 Back to the ultimate story, it’s “The Champ” meets “The Burger Steak” kind of thing and consuming them altogether. 🙂 I was quite hungry then but I held half the rice; the rest disappeared in an instant, nonetheless. I would also like to share the same sentiment of another food blogger last night – Melo from Pinoy Cravings, that the combination of the french fries and the mushroom gravy (which spills over to the fries) made an interesting combination you might also want to try. Jollibee Ultimate Burger Steak: 1/3 lb. 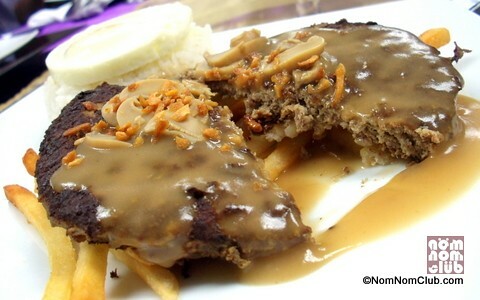 CHAMP patty + mushroom gravy + mushroom slices + toasted garlic+ french fries + egg.